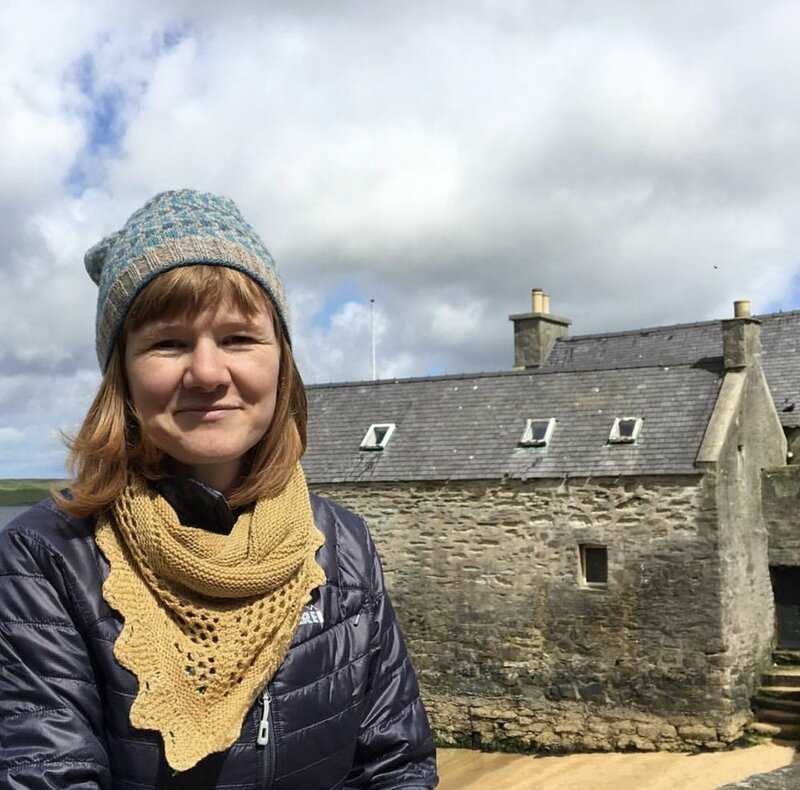 I am so excited for you all to meet Gudrun Johnston, a Shetland knitwear designer who has graciously agreed to teach all of us newbie knitters the ropes (or yarn, I should say!) in our 3 class series of Beginning Knitting Classes. She moved to Reno fairly recently, and we met when she came into the The Nest. She is as sweet as she is talented! I know when you meet her, you will adore her as much as I do. I was so stoked when you agreed to teach beginning knitting classes at The Nest because I felt like it was the equivalent of having Michael Jordan teach us how to shoot a layup. For anyone who doesn't know, what exactly is it that you do? Well first of all I am incredibly flattered by that comparison! I refer to myself as a knitwear designer. Most of what I do is create original knitted garments and accessories and then write up a pattern that can be downloaded and knit by others. Seeing what knitters make from my patterns is endlessly rewarding. Thanks to to the internet, people from all over the world can access my patterns. I also travel to teach knitting techniques and traditions in various locations in the US and abroad and lead textile-related trips to the Shetland Islands in Scotland! How long have you been knitting and how did you get started? I know I learned around the age of 10 or 11 and remember making a pastel green vest (which I no longer have!). However, I didn't return to knitting until a lot later. Only about 14 years ago, actually! The instigation was partly due to the area we moved to where the fiber arts were strong (Western Massachusetts). The other significant impetus to pick up my needle again was that my daughter, who was 5 at the time, had lost a much beloved blanket that someone else had made for her. I walked past a yarn shop with a cute little poncho in the window and was inspired to go in and get the pattern and yarn. I looked at the instructions and had no idea what some of them meant, but armed with "The Idiot's Guide to Knitting," I knit up that poncho. It went on to be much loved by my daughter, and even now she still sleeps with it in her bed (she is 19)! After that I was obsessed with the craft and quickly found myself starting to make up my own stuff. Any advice for new knitters? Yes. Do not be put off by instructions in patterns! I seriously believe that a well-written pattern can be knit by anyone. There are so many additional resources these days by way of youtube videos and other online tutorials that even if you have no one to teach you in person, you can still learn! It's also important to know that you don't have to knit all the stuff. If you only want to knit scarves that is totally legitimate! You are still a knitter! How does a Shetland knitwear designer end up in Reno, Nevada? It does seem a little random, I'll admit! Basically, my husband took a job at the university here. We absolutely love it. It has exceeded our expectations. As a knitwear designer, I love that there are plenty of months for wool wearing! I know that you are constantly traveling around the world teaching advanced knitting workshops to avid knitters. What draws you to teach us bumbling beginners? I am so excited to teach beginners in my new-to-me local community. Although I tend to teach intermediate to advanced workshops, I am looking forward to seeing new knitters discover the pleasure of this craft! INTERESTED IN TAKING A BEGINNING KNITTING CLASS WITH GUDRUN?